Get merry around town with these tree lightings! The oohs and ahhs heard at the lighting of a Christmas tree are sounds you only hear once a year, unless you attend every tree lighting on this list and then you can hear the excitement about ten times! 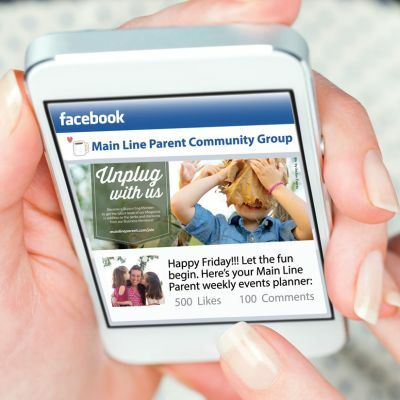 Tag your pics on Instagram with #mainlineparent, we’d love to share them. Does your family love holiday lights? Don’t miss Holiday Lights on the Main Line and Beyond! Santa illuminates the night for the first time this year to help kick-off Sesame Place’s “A Very Furry Christmas” holiday celebration! After some holly jolly singing and dancing with Santa’s trusty elves and everyone’s favorite Sesame Street friends, Santa will arrive on a horse-drawn carriage to light up the night with millions of twinkling lights! Celebrate the beginning of the season with a visit with Santa, musical performance by the Oxford Arts Alliance, cozy fire pits, snacks, shopping, and the tree lighting at 6 pm. Santa arrives on a fire truck for the Ardmore Tree Lighting! Enjoy hot chocolate and cookies, caroling, and then stay for dinner at one of Ardmore’s many restaurants. It’s the most wonderful time of the year again! Festivities take place at the Floral and Hardy complex, including the lighting of the village tree. Family fun takes place up and down Wayne Avenue from the Train Station to the Fire Department. Festive caroling, horse drawn carriage rides, ornament decorating, and more make for a super family fun night. The magical evening is topped off by the lighting of the Christmas tree at the Wayne Train Station. Many stores will have extended shopping hours. Malvern’s Christmas on King on December 1 is an all day party! Beginning at noon, the King Street Merchants will be open for business with special promos, you can ride the Malvern trolley from noon to 4 pm, take in performances at Gallagher’s Lot, shop at a craft market at the Fire Company, and so many more special activities- including one of our favorites from last year, The Snow Globe Ballet by Ballet 180 (the dancers perform inside the Malvern Buttery, and spectators watch from the sidewalk through their floor length windows!). Santa makes his way to Malvern in the Santa Claus Parade at 5 pm, and then the tree gets all lit up at Burke Park at 5:30 pm. Come and see the big tree at the Berwyn Train Station get all twinkled up for the holidays! Event includes an ugly sweater contest, dancing and singing performances, free food and drinks from local vendors, and more. There will also be visits from special guests Santa and Mrs. Claus, Vixen the Reindeer, and 6abc Action News’s Adam Joseph. Come out to see Bryn Mawr’s annual tree lighting ceremony! Santa arrives on a fire truck, and hosts a special hot chocolate and cookie reception, too! On December 7, Phoenixville celebrates traditions old and new! There is a parade with Santa, local organizations and characters, then the annual tree lighting at the end. New this year, the Winter Wonderland Village in the Main and Bridge parking lot opens at 5 pm for a little shopping and snacks before the parade at 7 pm. Come out to see the tree lighting to kick off the holiday season at the Gladwyne Fire House! Photo of the Wayne Train Station Tree courtesy of Lisa Florio Photography.